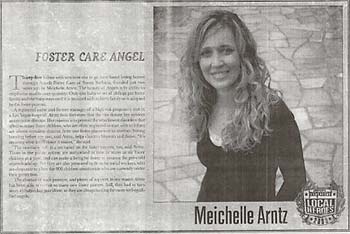 Thirty-five babies with nowhere else to go have found loving homes through Angels Foster Care of Santa Barbara, founded just two years ago by Meichelle Arntz. The beauty of Angels is its ability to emphasize quality over quantity: Only one baby or set of siblings per foster family, and the baby stays until it is reunited with its birth family or is adopted by the foster parent. A registered nurse and former manager of a high-risk pregnancy unit in a Las Vegas hospital, Arntz feels fortunate that she can donate her services as executive director. Her mission is to prevent the attachment disorders that affect so many foster children, who are often neglected to start with and then are almost certainly shunted from one foster placement to another. Strong bonding before age two, said Arntz, helps children blossom and thrive. "It's amazing what a difference it makes," she said. The one-baby rule is a lot easier on the foster parents, too, said Arntz. Those in the public system are authorized to take as many as six foster children at a time, and can make a living by doing so because the per-child stipends add up. But they are also pressured to do so by social workers, who are desperate to place the 900 children countywide who are currently under their protection. The absence of such pressure, and plenty of support, is one reason Arntz has been able to recruit so many new foster parents. Still, they had to turn away 43 babies last year alone, so they are always looking for more well-qualified angels.